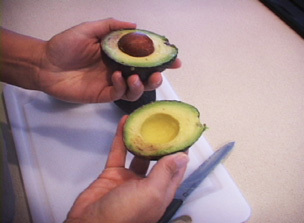 RecipeTips.com's video demonstration, 'How to Remove the Pit from an Avocado,' describes a quick way to get the pit out of an avocado. Hey, everyone! This is Laurie from RecipeTips.com. Today, I am going to show you how to pit an avocado. Select an avocado that is semi-firm but that has a little bit of give to it when you push on it with your fingers. Use a knife and you are just going to want to slice all the way down to the pit, the length of the avocado. Go all the way around and then just twist the avocado opposite directions, like that; then just take your knife, smack the pit, and pull it right out. Now, make sure to put lemon juice on your avocado, because avocados are going to turn brown really quick. For more great information, visit RecipeTips.com.